The Good Kind of Crazy: My Mitten Solution! cry that their hands are cold. 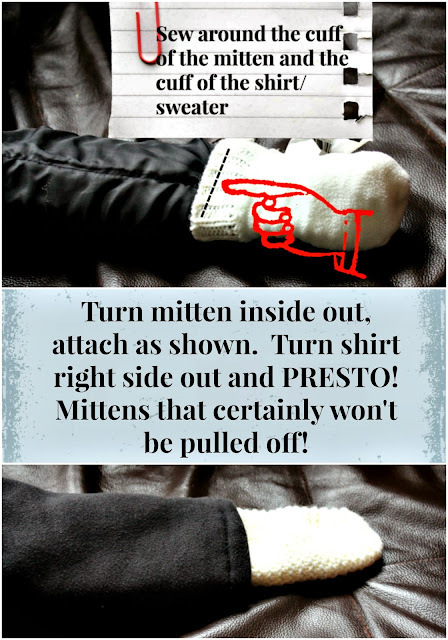 Their cause and effect thinking is not entirely developed and there is no way to explain to them that they NEED mittens. 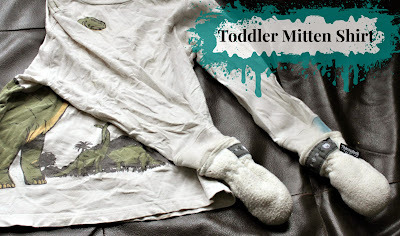 My second, very strong willed, child was absolutely impossible to keep mittens on. I could put them back on 100 times and he would still have them off in a jiffy - usually having the first one off before I had a chance to finish putting on the second. I bought the long ones that go up to the elbow - still took them off. I put elastic bands around his wrists to try to keep them tight - he still pulled them off. The kicker is, he would stand at the back door crying to go outside. I couldn't keep him indoors. I had to come up with a solution. Listen, I know this is an extremely wrinkly shirt. This shirt gets worn and worn and I certainly don't wash it every time. Points for being real? Haha. Here's how to attach mittens to a shirt for your toddler. 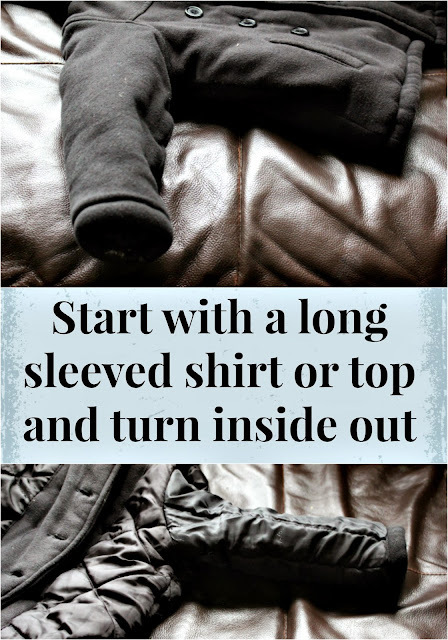 I attached mine to a long sleeved t-shirt so it could be layered under a snowsuit, but you might want to attach it to a zippered or buttoned shirt to make it easier to put on. Notice the stain on the arm? I picked a shirt that was otherwise un-wearable so I could re-use something I was just going to rip into rags. This is a great way to limit what battles you have to pick with your toddler. Eliminate the issue. I'm always looking for great ideas!